Want to Take Your Prints to the Next Level? My Printmaking Master Classes series of printmaking instruction videos are now easier to access than ever. You can see trailers of all of them here below. I’m convinced that these videos will help you and thousands of other printmakers to take both their plates and their prints to the next level of expertise. Here below are the preview videos of my seven Printmaking Master Classes. To purchase the full version of any one of them just click on your preferred form of payment button below the preview. That will permit you to pay and access the video. You can select more than one. As soon as we receive payment we will send you a link to your video(s) on YouTube. (You will note that we are now required to quote prices in euros instead of dollars. A dollar is approximately 86 cents.) Thanks for considering these learning videos. We’ve put a lot of love into them. I hope it shows. Maureen presents a series of useful tips to make your studio a more pleasant and profitable place to work. She discusses press care, safety measures, deckle edges, solar-plate tips, tarlatan economy and much more. Putting all these tips into practice will make a significant improvement in you day-to-day working processes. This master class picks up where Traditional Printmaking 1 leaves off. It deals with aquatint, sugar lift and marbling. An artist who masters the techniques that Maureen explains on the two Traditional Printmaking videos should be able to produce exhibition-quality prints. This is a curious technique which uses a plumbers’ epoxy adhesive to create wonderful relief plates. Video includes creating plate and creative printing techniques, including a ghost print. Length: 27:36 Price: €18.00. This technique takes everyone by surprise in the most delightful ways. Using it you can create an incredibly nuanced, multi-color relief print on a single plate and with a single pass through the etching press. It has to be seen to be believed. When a printmaker sees one of these prints the question is always the same: How did you do that? A printmaker brought me a couple of plates recently, asking me what she could do to improve them. I suggested we pull a few prints in order to see just what was on the plates. We finished four hours later with a series of exhibition-quality prints, without making any changes to the plates. That’s creative printing. A chop–that little relieve image embossed white-on-white at the bottom of your print–adds such a note of class to your work, and it’s not difficult to create. Solar plate has an undeservedly bad reputation. That's because too many solar-plate prints look like simple bad photocopies. Excellence in solar-plate printmaking requires precisión every step of the way, with closest attention to the acetate. In this video Maureen shows how. 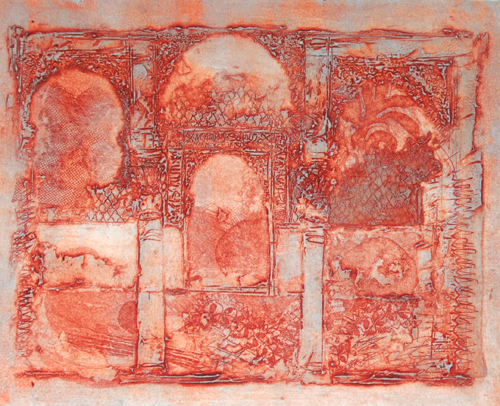 Preview of “Traditional Printmaking 1″ Master Class. Maureen goes over the basics of acid etching on copper or zinc plates. This is where the magic begins and if you don't get it right now you'll never get it right. .WWhat’s a Gallinero? And why would you want to stay there? I’ve started on a series of medium-sized liquid-metal prints on Alhambra themes. Granada’s medieval fortress and palace has been for centuries a source of inspiration for artists, writers and photographers, so much so that today it’s difficult to get an original take on it. This time I’m relying on the inherent looseness of the liquid-metal technique to try to achieve Alhambra images with some originality. I had one of those wonderful printmaking experiences at the beginning of this project. The first proofs I pulled from the first plate, El Patio del Harem, looked frankly great and I thought, “This is it, I’ll print up an edition.” But before I could start, I took a close look at one of the plates from which I had just pulled a proof. In the ink residue left on the plate I could still see beautiful detail. So I rubbed a light layer of yellow ink into it, rolled some fresh silver ink on top and put it back through the press, making a “ghost print.” I was shocked to see how superior the ghost was to the live one. I have placed the original print at the top of this post, the ghost below. See if you don’t agree with me. 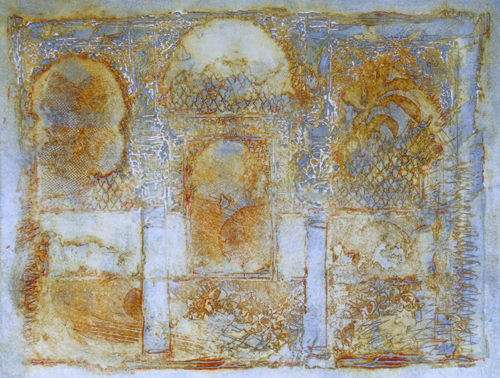 This print was done with liquid metal on an old, previously-etched copper plate, a still life with fruit. I put the cold solder on with a palette knife and when it was still quite sticky I drew into it with a stylus. I didn’t press any texture elements into it until about an hour and a half later. I left it overnight to harden and printed it on 600 gr. handmade paper. The ghost print was printed on 375 gr. Paperki handmade paper. I like this one better. In 2009 our son Bill and his wife Victoria adopted a two-and-a-half-year-old boy from an orphanage in Madagascar. We picked them up from the Granada airport when they arrived back with Claudio, after a two-month get-to-know-each-other period on the island. Claudio was in Bill’s arms with his hand stuck reassuringly in his new father’s shirt. Claudio is now four. He speaks Spanish like a four-year-old Granadino, and loves to paint. the plate then did all the line work. The nitric acid (28%) was diluted12:1.
a feather, so as to keep the lines clean. There is no aquatint on this plate. on with watercolor after the print is pressed. We usually think of fine-art printmaking as a solitary endeavor, and until recently it has been that for me. But after years of yearning I finally got my Gallinero artists’ residence built, my husband Mike did a terrific job of introducing it on Internet, and artists started coming from all over the world. Most of them arrived by themselves to work together one on one. This was a relatively new experience and it has opened my eyes to new ways of working and new joys in printmaking. When I conceived this video tutorials project I was determined that my first subject should be printmaking with Maureen Booth. I’ve known Maureen and her husband, Mike, for years. In fact, we live just a couple of kilometers apart on the outskirts of Granada. I’ve worked with both of them on other projects and have always admired Maureen’s prints, as well as their uniquely creative lifestyle. Maureen was actually the female lead in Bive, a 38-minute short film I made in 2006. She played an English printmaker who falls in love with a Spanish fisherman, causing an uproar in Mediterranean fishing village. That film had a brief printmaking sequence which opened my eyes to the magic of creating art with inked plates. Now, seven years later, I have the privilege of working again with Maureen and delving further into her printmaking world. I hope you find the experience as rewarding as I did. What’s a Gallinero? And why would you want to stay there? - A fresh take on some of the printmaking techniques you're already using. - Some new techniques which can refresh your ideas and your enthusiasm for making prints. - Some fresh thinking about creative ways of printing your plates. - A general "loosening up" of your approach to making prints. If there's a secret to successful printmaking it's: Have fun!